Spectre has continued to top the North American box office in its second week of release. The 24th James Bond movie, starring Daniel Craig, made $35.4 million between November 13 and 15, according to estimates. The Peanuts Movie held firm at No 2, with takings of $24.2 million. Angelina Jolie and Brad Pitt drama By the Sea failed to make a splash, taking just $95,440 at 10 screens. The European art house film stars the real-life couple as a husband and wife struggling to cope in the aftermath of a trauma. The movie was also directed by Angelina Jolie – her third time at the helm of a movie – and the actress also wrote the script. By the Sea, which marks the first time Angelina Jolie and Brad Pitt have appeared together on the big screen since Mr. & Mrs. Smith in 2005, has been generally panned by critics. Despite its poor takings, By the Sea’s limited release is thought unlikely to hurt its film company, Universal, too much since it was made for a relatively modest budget of $10 million. 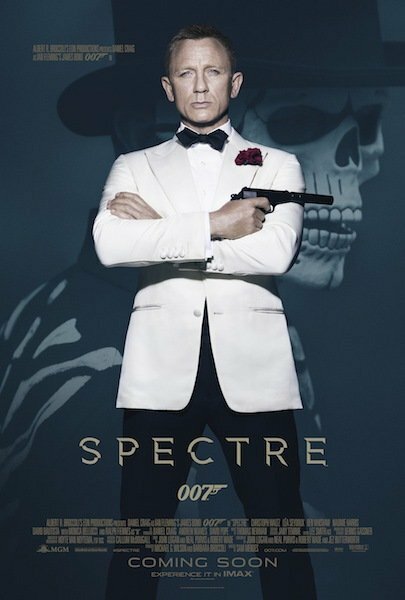 Spectre‘s takings fell 50% in its second weekend, bringing its North American total to $130.7 million. That is well behind the $161 million earned by its predecessor Skyfall over the same period. The Peanuts Movie – the family-friendly adaptation of the beloved Charles Schulz comic strip, featuring Charlie Brown and Snoopy – saw its second weekend takings drop by 45%, bringing its total in the US to $82.5 million. The rest of the top five saw Love the Coopers, an ensemble comedy about a family gathering starring Diane Keaton and Alan Arkin, enter the chart at number three with $8.4 million. Old release The Martian dropped one place to No 4, while at number five was another new release, The 33. The 33, based on the 2010 Chilean mining disaster, took $5.8 million from 2,452 theaters.